According to media report, almost 500 Chinese websites got "defaced" on web page from a hack group - Anonymous China, these websites including government sites, official agencies, and trade groups. The attached sites published on Pastebin. Hacker left a message that against the regime, typical a kind of protest. 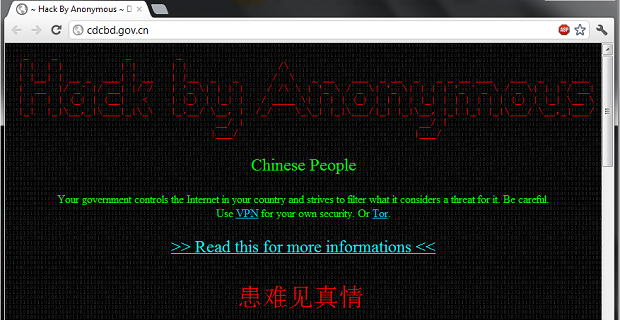 It also left a message to tell Chinese internet users about how to bypass censorship from government. 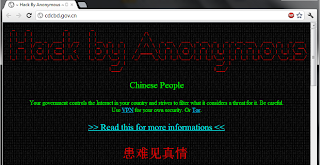 It also did second attack after some Chinese sites cleaned up, still have some sites offline and displays hacked page. Unknown who behind this hack group.